Since moving to the West Coast four years ago we have a new holiday tradition, which is to get a Christmas Tree permit from the National Forest Service and find our Christmas tree in harvestable land in the nearby national forest. In California that was Tahoe National Forest. Here it's Gifford Pinchot National Forest. 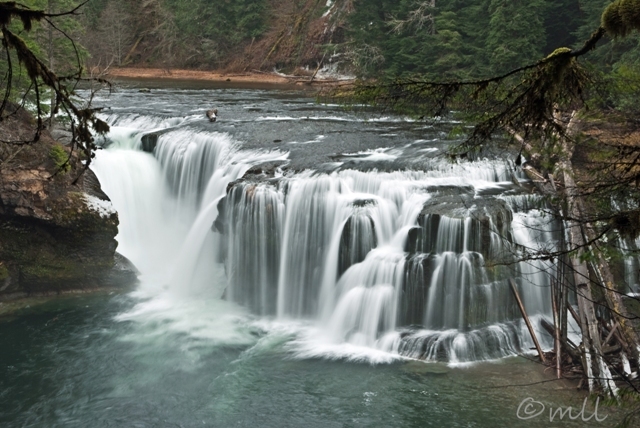 I had been wanting the check out the Lower Lewis River Falls, so we headed deep into road NF-90 and visited the falls before hiking around and finding our tree. Actually the woods were pretty thick around here, so I'm not sure this was our best location. Next year I think we'll try a different spot. But the National Forest is pretty huge so we have plenty of options. The idea behind the Christmas tree harvesting is actually to help the forest grow by thinning out areas where the trees are growing to close together. So an acceptable Christmas tree is growing within ten feet of another tree and has a base that is less than 6 inches in diameter. Plus whatever else you like in a Christmas tree. I like space between the branches so the ornaments can hang freely; this makes a woodland tree a perfect choice for us! And it's such a fun tradition! One of the things I really wanted to see when we visited haystack rock a few days ago was tidal pool life. And since we showed up just after high tide, we were limited in the tide pools we could explore. Ecola State Park, just down the road from Cannon Beach, has a very rocky beach full of potential tide pool activity. 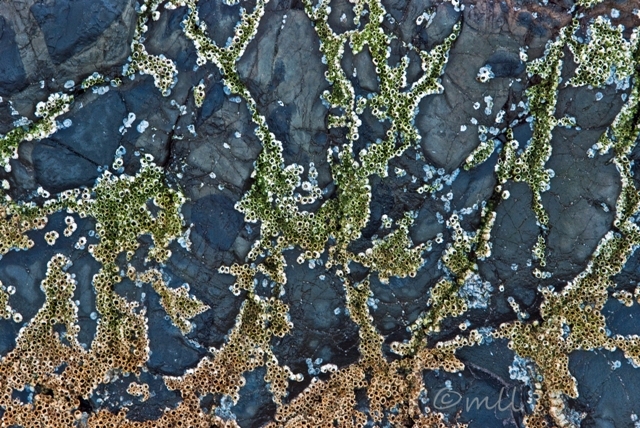 I climbed precariously around on some of the rocks as the tide was slowly moving out. I did manage to find a few anemone hiding deep in the shadowy areas of a few tide pools, but no starfish which I was really hoping to see. This is why I really need to go back during low tide. I keep reading about these wonderful tide pools, and I really want to see them. For today, I've got some barnacles, which were the only tidal area life I found and photographed to my satisfaction. 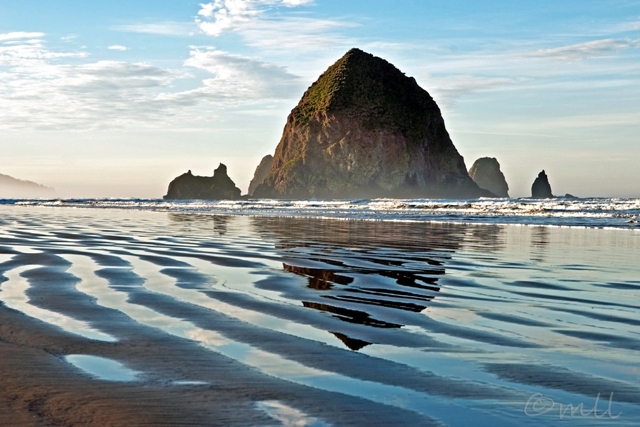 Haystack Rock in Cannon Beach is an iconic Oregon landmark and tourist destination along the beautiful Oregon coastline. Everyone had the day off school, so we made a short day trip out to Cannon Beach earlier today. Such beautiful weather today too, calm and slightly foggy in the morning. The tide had just started to ebb, and there was a great wavy pattern in the sand which left these interesting tide pool patterns. If we had showed up later in the day, the tide might have been out past the monolithic haystack rock and we could have explored it closer up. Next visit here, I will pick a day when we can show up at low tide. Still, I was very thankful for such a beautiful day along the coast! Happy Thanksgiving to everyone tomorrow! 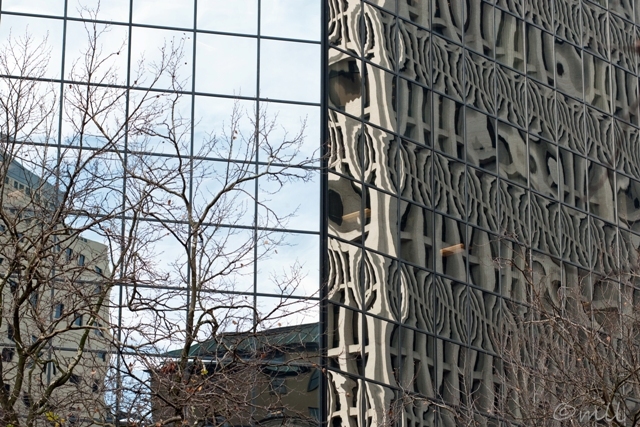 reflected off the sides of this glass building. 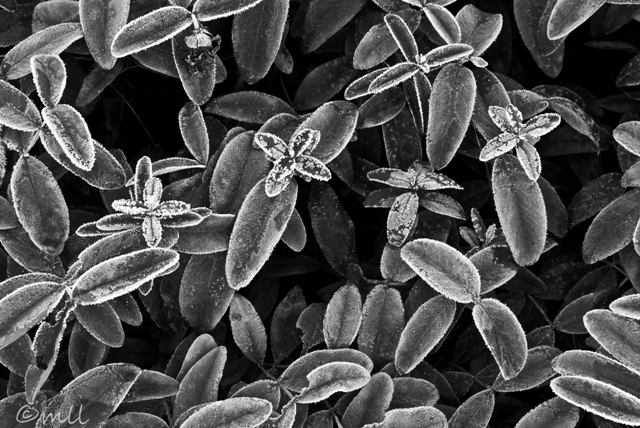 I'm getting used to seeing this frost each morning. We're in a pretty nice weather pattern right now. Morning starts out cold and clear, blanketed in frost, and the rest of the day is sunny and pretty mild for late November. Nothing like the weather reports I'm seeing on TV for the rest of the country. I wasn't out that early this morning; this is just a patch of ground cover in a parking lot near Anna's school. It was still in the shade around 10am or so, and the frost was softening up but hadn't completely melted yet. It was a contrasty scene, so I figured I'd try it in black and white. 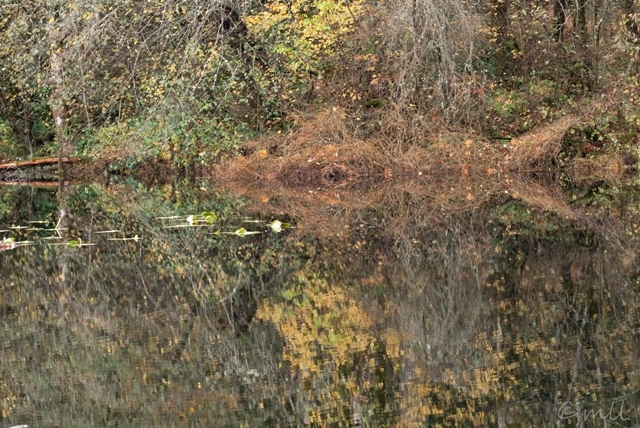 Something is fishy here...I think these brown twining branches and their reflection work together to make a fish shape. And that dark spot in the middle reminds me a little of one of Eric's favorite childhood stories, "Swimmy," by Leo Leonni. 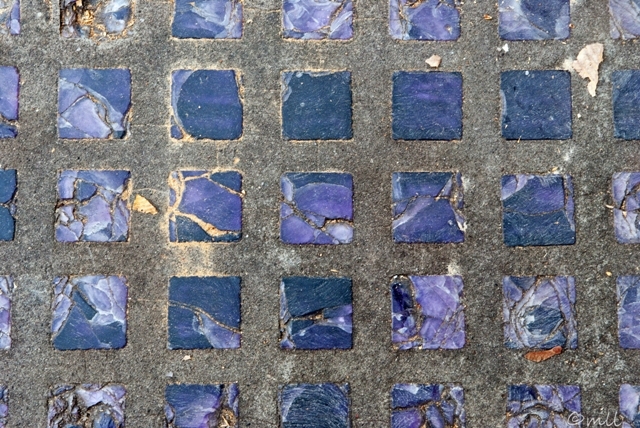 I was surprised to find this purple sidewalk glass earlier today when I was walking in downtown Vancouver. I first encountered it during the Underground Tour in Seattle's Pioneer Square District. In Seattle, the original street level was raised one floor, I believe to correct drainage issues. Anyway, the original ground floor found itself underground. And when the sidewalks were added, they included these purple prism lights, which funneled light down to the basement level understreet. This was all done in the late 1800s. I suppose these sidewalk skylights were installed at about the same time here in Vancouver. I wonder what is under this sidewalk! I think these squares are made with amethyst, but I"m not sure on that. They're awfully pretty in my opinion, and really I think they've held up pretty well. I'm feeling under the weather this week, and trying to take it easy, but I have this photo from my trip along Historic Highway 30 in Oregon earlier this month. 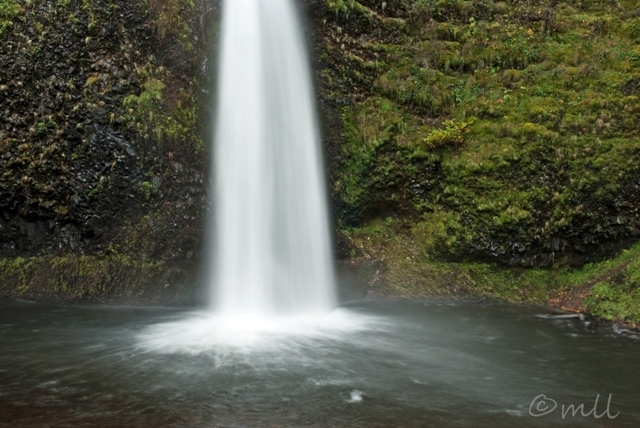 Horse Tail Falls is just one of many waterfalls between Portland and Bonneville Dam on this route. This particular waterfall lands in a round pond at the edge of the road, so the viewing area is surprisingly close to the falls. I'm always anxious on these driving beaches when the tide comes in because sometimes the water gets awfully close to parked cars. I worry that the drivers won't notice that their cars are about to be under water, and so I have to scan the beach nervously, wondering if the car will drive away safely or be pulled out to sea. The driver always pulls away just about the time I start noticing the car. But this one was different. The tide actually washed up over the wheels before the car lights came on. I breathed a sigh of relief, and then to my surprise the car took off into the ocean and proceeded to drive very fast through the water! I hurried to take a photo, but I wasn't prepared with my camera settings to shoot into the sun like that. Still, the photo gives a pretty good idea of what was going on. A crazy driver for sure! I would NOT recommend doing this!!! When the car emerged and drove past us I noticed that it was a Land Rover. I suppose this could be in one of their commercials or something...but still! 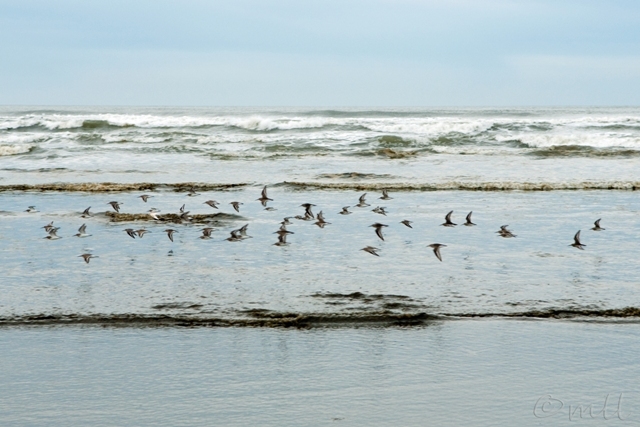 In spring and fall, the Washington coastline is full of these migrating shorebirds. They flock together in the thousands, and amaze bird-watchers with their intricate aerial maneuvers. It's the pattern of striped upper wing and white under wing that is so mesmerizing to watch as the birds twist and turn in flight. I was so happy to see small flocks of these birds dart back and forth along the coastline during our visit to Ocean Shores, Washington last week. I read that a small number of these birds overwinter in Washington. Lucky for us! 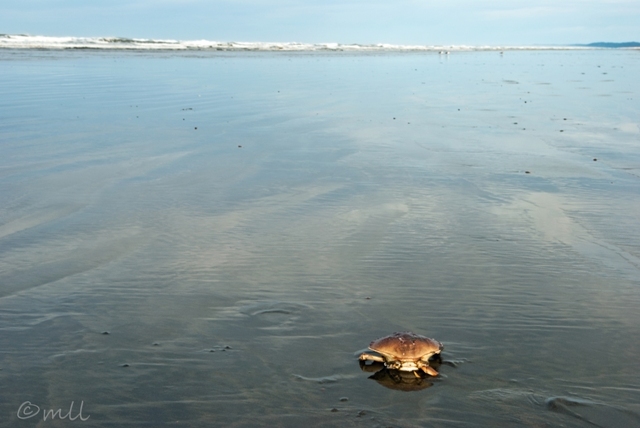 It's pretty common, walking along the beach as the tide goes out, to see crab shells, but I've never seen a live crab like this before. I'm not sure how he got here, but it wasn't a good sign for him. He was surrounded by hungry seagulls when we approached. The seagulls were lurking in the background waiting for us to leave. I'm not sure what happened after we headed down the beach, but I think this little guy turned into breakfast. 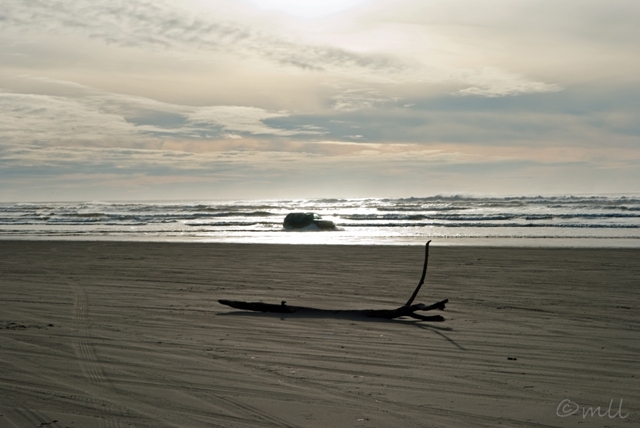 Beach-combing at Ocean Shores, Washington. This was the closest I got to photographing Clover and Anna walking along the same vertical plane; a little of Anna's feet show. She was blissfully searching for sand dollars. Clover was blissfully tagging along. Growing up along the shores of Lake Michigan, I've always been partial to the sand there, soft, off-white, and very clean. But I have gained an appreciation for some qualities of this Pacific Northwest sand as seen here in Ocean Shores, Washington. This sand is much dirtier, darker, and finer-grained, packing almost like clay, which is why people can drive on the beach here. As water washes up onshore at Lake Michigan, it sinks almost immediately through the sand. 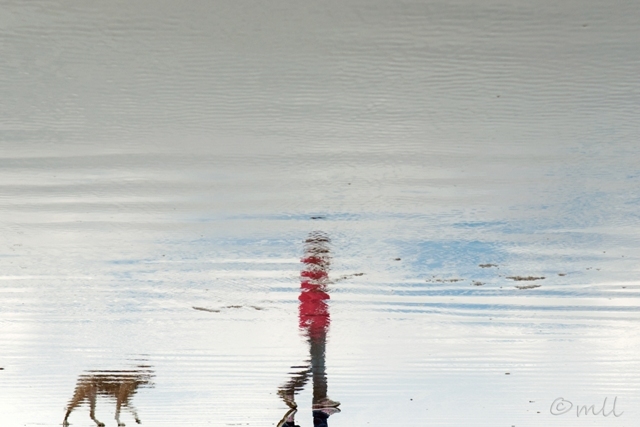 In Washington, a thin layer of water sits right on top of the sand as the waves recede, leaving this expansive reflection. Add to that the fact that small tide waves move so much further up the beach than waves on the Great Lakes, and I think this combination makes for a surreal scene, part seascape, part cloudscape. We got away for a few days over Veteran's Day weekend. 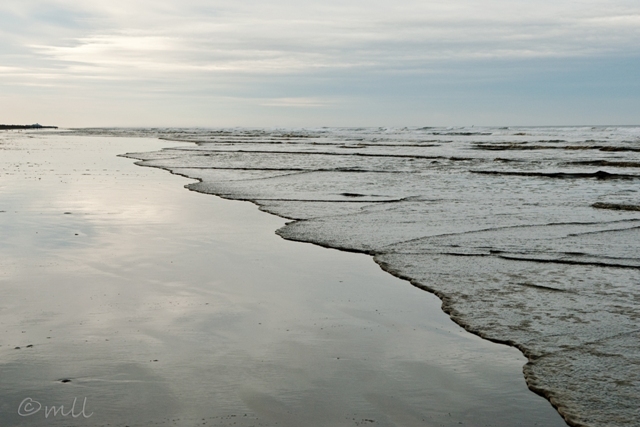 A short trip to Ocean Shores, Washington. 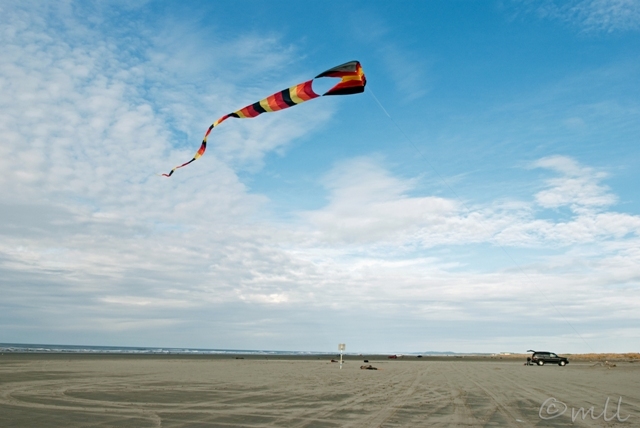 This town hosts several kite festivals during the year. No festivals during our visit, just a few kites flying in the wind. This particular kite was up both days. I wish I'd talked to the owner, barely visibly at the back of his SUV. I wonder if he was just out for the weekend, or if he flies the kite daily. And I wonder how big this kite measures. When we arrived on Sunday he was just finishing up, so we got to see him packing up the kite which was quite an ordeal, folding it just so with a strong wind blowing. I was glad when he returned on Monday so I could get a photo. I worked on a series of photos last spring at a blossoming almond orchard in California, and when I saw this row of pear trees in Hood River last week, I was curious to see how these fall colors would compare in a similar composition. One of the things that really fascinated me about the almond orchard in Capay, California was the slight variation in blossom color between the rows, with some rows blossoming white and others pink. 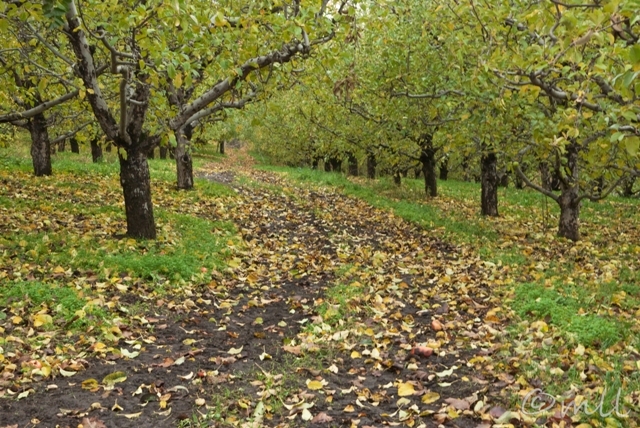 The same thing was going on in this orchard; some rows of pear trees were leafing yellow and some red. I think the trees are spaced a little closer here, so the overall effect isn't as striking, but overall it's got a nice fall color. If you're curious to see the blossom photos from springtime, the links are here and here. 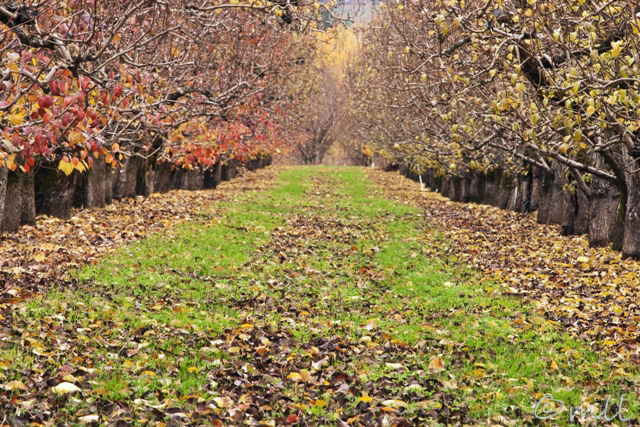 This orchard in the Hood River Valley is closed for the season, but the access road through the orchard still looks so inviting. I'm not sure what variety of apple grows on these trees, but I was drawn to the pretty Granny Smith green leaf color. Maybe it's just the time of year, but pears like this one always remind me of Christmas. Just looking at this pear makes my mouth water. It's so high in the tree that it was out of reach at picking time, so it just hung there...mocking me. 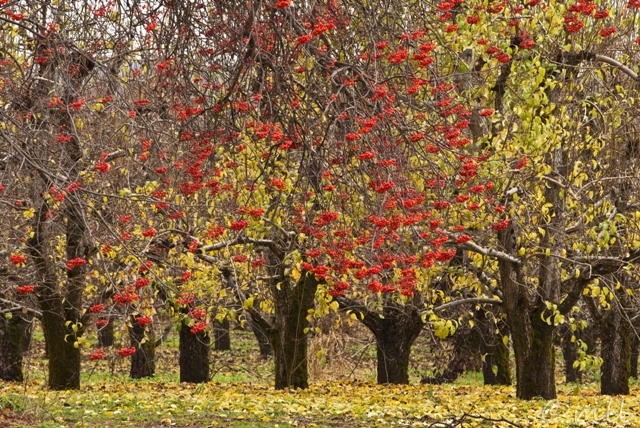 These red berries are hanging from a large tree in the front yard of an orchard farmhouse, and it was the bright red berries that made me stop and take notice of this scene. 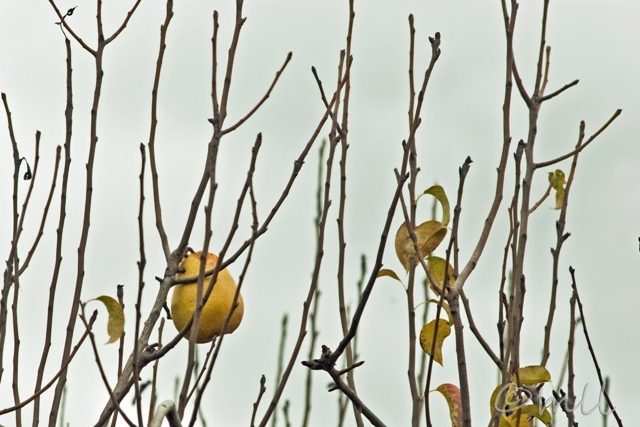 I'm sure I've photographed a pear orchard in the background; there were plenty of pears still on the yellow-leaved trees for me to figure that out. I'm a little less sure of the Mountain Ash. I did an internet search, and I feel like I've identified it, but if not I'll have to change my title later. If this is Mountain Ash, then it looks like the tree will keep these berries all winter, which would be really pretty! I traveled east along the Columbia River Gorge yesterday, and one of my stops was the Bonneville Dam. The fish ladder wraps partially around the visitors center, and funnels salmon up and around the dam. I can't say I saw any salmon heading up the ladder when I was there. I think I missed the main time when they run. I liked the colors though; the weather was overcast and the water looked so green. 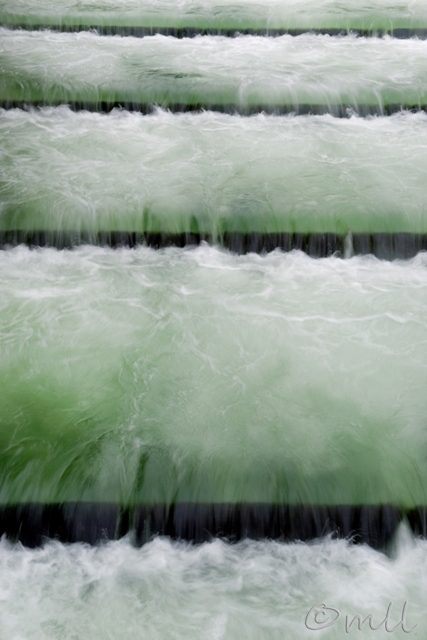 I was thinking the lines and colors might make an interesting abstract so I tried to photograph the greenest area of the water. Or Through My Rainy Windshield #2. 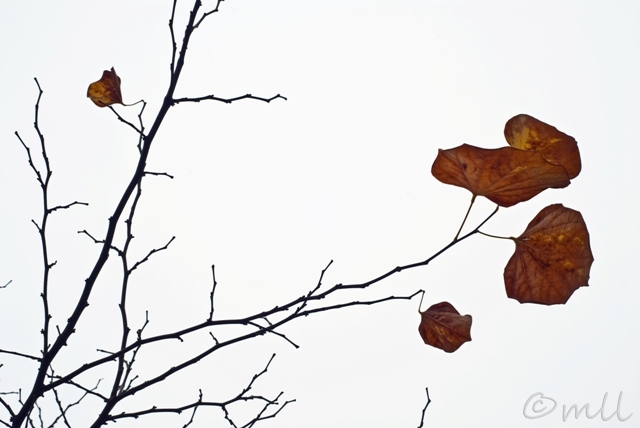 After a very sunny October, our weather pattern has turned and given way to a drizzly November. 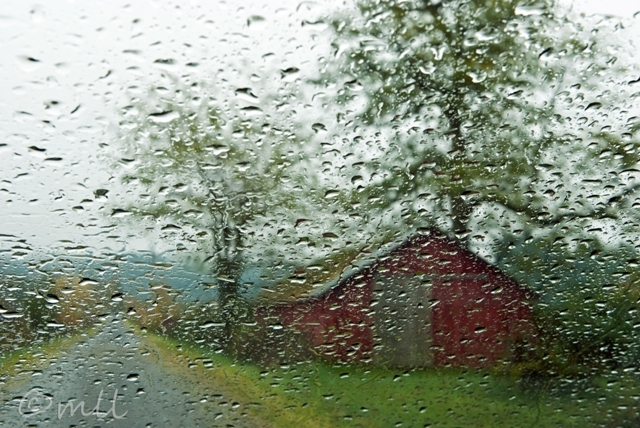 Today is another big errand running day, but I managed to take a little detour in between a drop off and pick up this morning to explore the countryside north of Camas and continue the "through my rainy windshield" series. It seems like all I do these days is run errands. 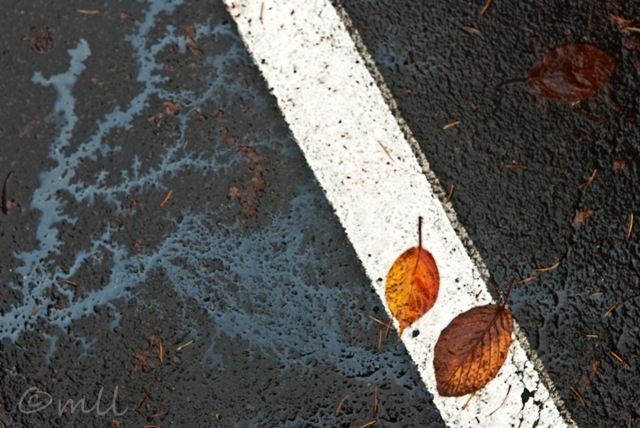 This scene captured my errand-running mood today, looking down in the parking lot as I got back into my car. I decided I'm blocking off a day later this week to head out with my camera! 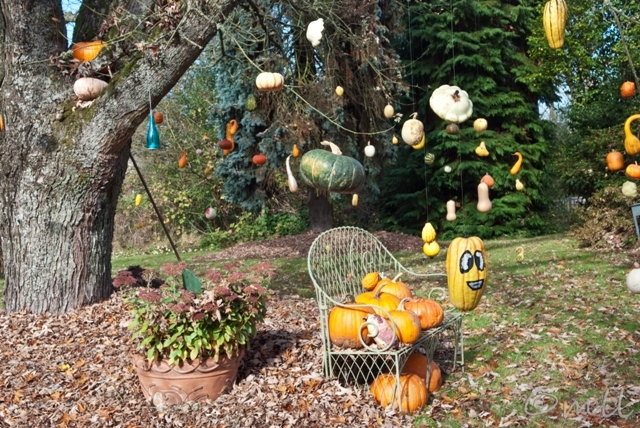 I happened past this gourd tree yesterday and had to stop for a photo. The photo doesn't do the scene justice though. The tree is old and spreads across the entire yard, and the gourds continue like this the whole way around. Hundreds, I'd say. It was quite a sight, and the family that lives here definitely appreciates having such a lovely old tree. I was already smiling when the little gourd with the painted face spun around and smiled at me, but that sight really made me chuckle. I couldn't imagine a more perfect day to usher in my favorite month: overcast and cool. Very colorful with plenty of leaves still on the trees today, although not so much for this little tree that caught my eye when I was out walking with Clover earlier this morning.